SQUAMISH, BRITISH COLUMBIA — Most of us celebrate new year with Champagne and renditions of “Auld Lang Syne” — and we do it on the same day of the calendar each year. Not so for members of the Myuk clan of the Salish Nation, Jonathan Clark tells me. “When herring starts to run that’s when the new year begins,” Clark says, divulging one of many tidbits he imparts on his guests. 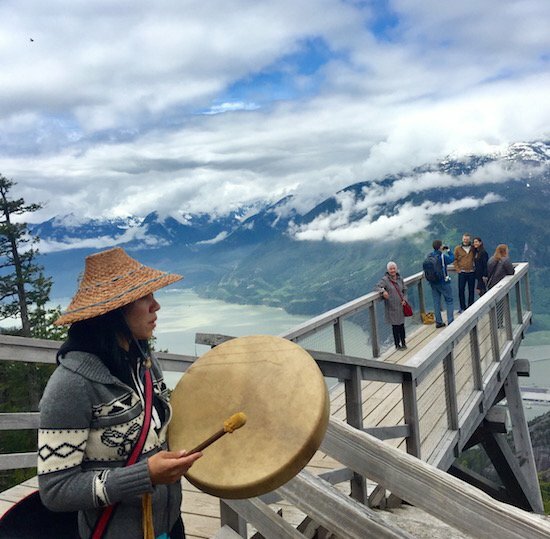 The Talking Trees Tour at the Summit of the Sea-to-Sky Gondola is rich with history, cultural knowledge and magnificent scenery. At the top of Mount Habrich — a peak named after the local resident who marked out its hiking trails — is a view of Howe Sound that will halt you from whatever activity you’re doing (including texting) and command your attention for minutes. It’s gorgeous — and accessible to just about anyone because of the ease of the walking trails. The summit is also surrounded by trees with deep importance to the Coast Salish Indigenous people. 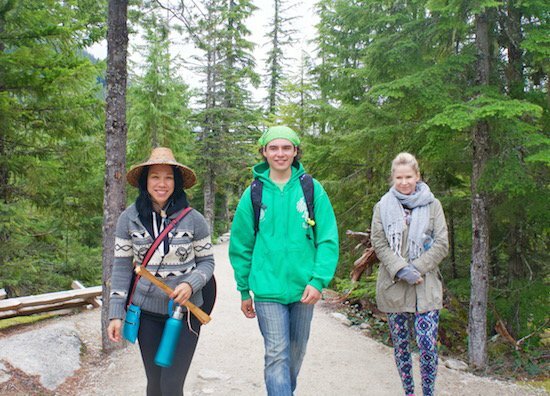 With the introduction of the Talking Trees Tour this year, the Sea-to-Sky Summit has added a meaningful experience to its programming. Operated by Talaysay Tours, the Talking Trees excursion takes place daily and is the latest attraction in Squamish, a city of about 20,000 people midway between Whistler and Vancouver, and a locale that is at the top of many British Columbians’ list of potential relocation spots. Squamish is growing fast, with annual population increases of about 3 per cent during each of the past three years. And with that growth comes more attractions that draw tourists too. The hiking tour, which moves across flat terrain, lasts 90 minutes and begins with a song. Aboriginal guide Ecko Aleck of the Nlakapa’mux Nation performed a traditional prayer to honour the landscape we were about to enter. If you explore, you’ll discover Squamish is full of energy elsewhere, too. 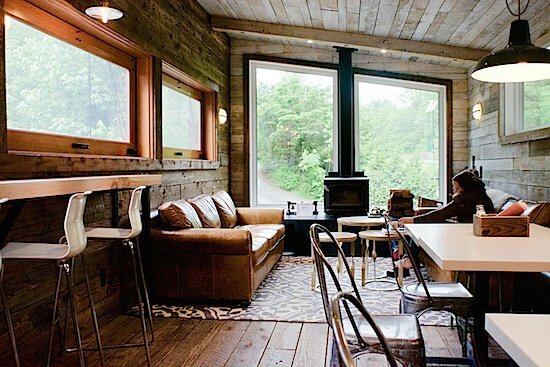 Demand for breakfast at Fergie’s was so great at Sunwolf Lodge that the owners expanded, adding a trailer that’s been beautifully redesigned to resemble a chic cabin. The trailer provides seating in a cozy environment ideal for sipping Fergie’s excellent coffee and enjoying its sensational breakfasts. 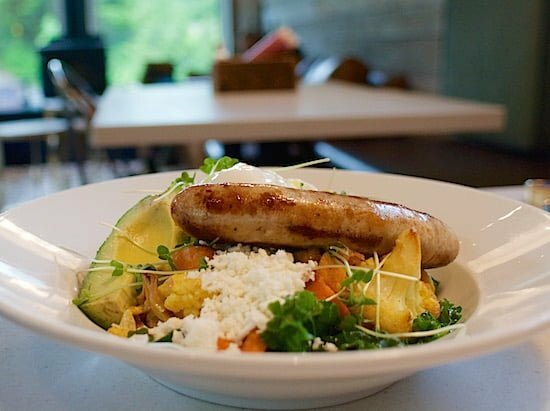 The sausages are made in-house and the breakfast options feature Eggs Benedicts in a variety of options (try the Avocado Benny with goat cheese, roasted tomato and hash browns, $14). Once one of the top white-water rafting operations in British Columbia’s Lower Mainland, Sunwolf is now focused on growing its restaurant business, increasing its cabin rentals and hosting more weddings. Owners Jess and Jake Freese have made a struggling enterprise into an entrepreneurial success story since taking control of Sunwolf about seven years ago. The riverside cabins, which feature full kitchens and luxurious bathrooms, are located in Brackendale, a small community just north of Squamish known for its large population of eagles. Set in a campground, Sunwolf and Fergie’s have turned into a destination all on their own. The same is true for Backcountry Brewing, which opened in April and has been packing in customers since. 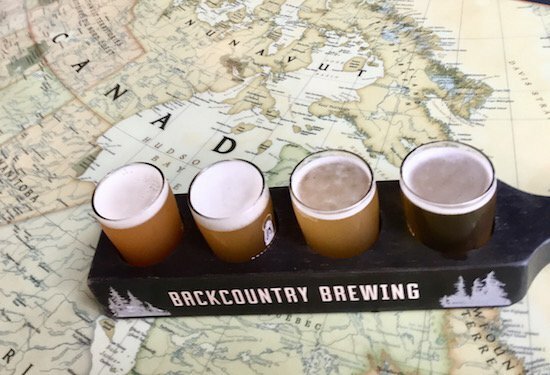 Ben Reeder launched the craft brewery with his four business partners after recognizing the opportunities Squamish presented and after studying the industry in the province for years. Their market research has served them well. The brewery started with 45 kegs a week but “we were blowing through beer from the beginning,” Reeder says. One of the key components is the guest space itself. The brewery’s tasting room encourages visitors to stay, rather than coming in only to re-fill an empty growler. Designed by a film-set decorator, Backcountry’s interior design is evocative of the Canadian outdoors, including old maps that are used as table decorations and the eye-catching, 1960’s-era lantern that is the main image on the company’s logo. And the menu offers quality pizza, salads and burgers. “We would be nothing without the food program,” Reeder points out, noting that people may come for the beer but they stick around for the food and ambience. While Backcountry originated the way most craft breweries do — with a handful of friends at a Christmas party saying, perhaps drunkenly, “Let’s do this!” — Reeder and his team took great care before launching. A 25-page branding document informed the enterprise’s look and its social media approach. The opening event needed three days because there were so much advance interest. Part of the success, as Reeder points out, is the city they’re in. In 2016, Vacay.ca named Sea-to-Sky Country the No. 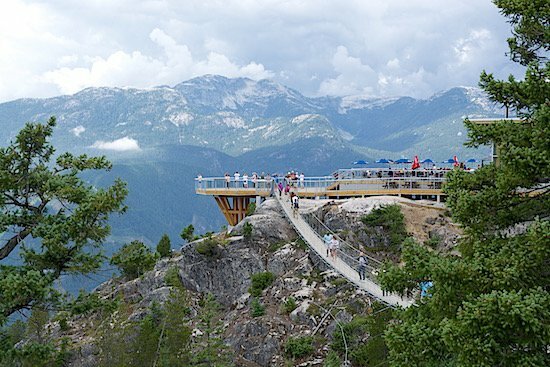 1 Place to Visit in Canada, largely because of Squamish’s hot new attraction — whose importance to the region has not slowed at all since its debut. Getting There: The Sea-to-Sky Gondola is about 65 kilometres (40 miles) from downtown Vancouver and easily accessible by car off of Highway 99 (aka the Sea-to-Sky Highway). Buses also travel from Vancouver to Squamish, including the Squamish Connector that costs $25 for a one-way ride (which include a free return trip on the same day of travel). Where to Stay: Sunwolf Lodge features cabins with chic decor, full kitchens and comfortable beds in a rustic setting among massive trees and alongside the Cheekye River. Nightly room rates start at around $129 for stays in August. Sea-to-Sky Gondola: Save up $2 when you book tickets online. Ticket prices at the window for adults cost $41.95. For full options and additional options, visit the gondola’s ticket page on its website. The Talking Trees Tours by Talaysay Tours cost $35 per adult ($24 per child).